Now holds more pods! 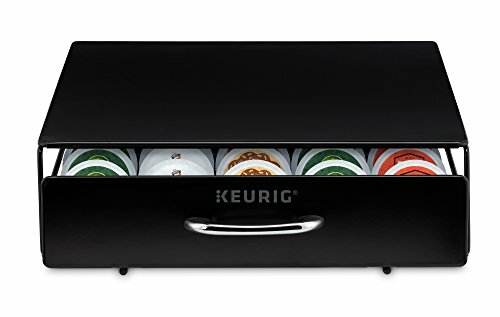 for people who want to keep their beverages close to their Coffee maker without taking up too much space, the Keurig rolling storage drawer is the ultimate space saving storage solution. Perfectly sized to fit underneath your Keurig Coffee maker, the Keurig rolling storage drawer holds up to 35 K-Cup pods or 15 K-Carafe pods, letting you keep plenty of your favorite beverages at hand while leaving the rest of your countertop free and uncluttered. For added convenience, the Keurig rolling storage drawer also features a unique wheeled rolling system that allows you to push your Coffee maker forward and backward under your cabinets with ease, making processes like refilling the water reservoir and cleaning even easier. Made of durable, high-quality materials that meet the highest Product quality and safety standards. Wheeled design: space-saving design allows you to push your Coffee maker forward and backward under your cabinets with ease.